I was a part of a team that worked on creating, engaging and entertaining a flourishing online community for Kirkland's. With a multitude of successful online promotions behind me, I'm always looking for "what's next?". And then along came Pinterest. We decided instead of just have a presence on Pinterest, we would explore this uncharted territory with an on-line promotion. 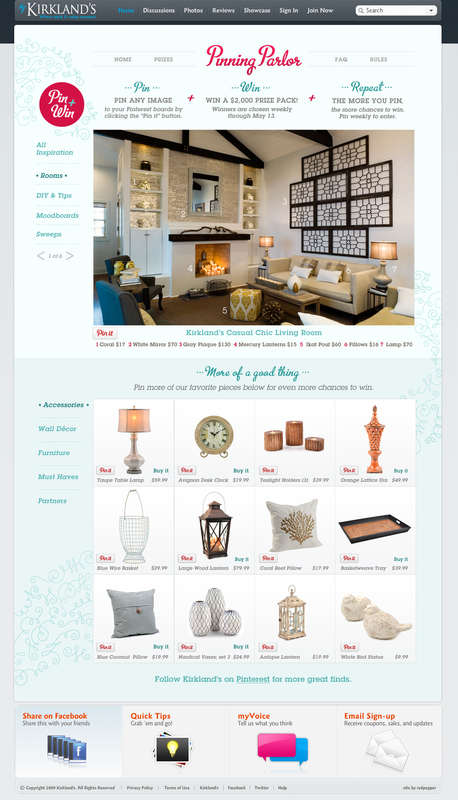 We created the Pining Parlor, one of the first retail Pinterest promotions of it's kind. For months I lived and breathed this project. I helped lead the strategy of why and how we chose pinterest. I studied Pinterest demographic vs. Kirkland's demographic. I ask our developers to write new code and experiment with unfamiliar technology. I studied the photography and content that got pinned and repinned and I helped created a lovely place (The Pinning Parlor) that housed beautiful, pinnable photography and set Kirkland's up as a DIY resource. We created ways to leverage our current audience to gain a larger following and in the end we increased on-line sales for Kirkland's. Kirkland's Pinning Parlor received hundreds of thousands of pins and repins, tripling the industry standard. Not to mention it picked up quite a few International awards in advertising, design and a couple for new use of technology.